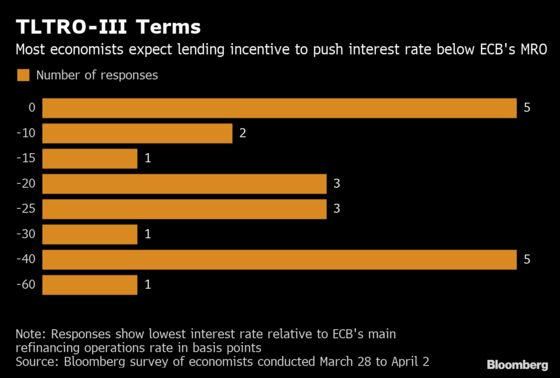 (Bloomberg) -- The European Central Bank will pay banks to lend as it tries to find ways to support economic growth that looks increasingly shaky, according to a survey. The cost of new long-term funding for banks which raise credit growth above a certain level will be lower than the main refinancing rate, with a median estimate pointing to a difference of 20 basis points. At current conditions, that would effectively provide lenders with a source of interest income as they struggle with weak profitability and a slower expansion. An announcement on the exact details of the longer-term refinancing operations is most likely in June. Officials unveiled their general plan in March, alongside a pledge to keep interest rates unchanged for longer. 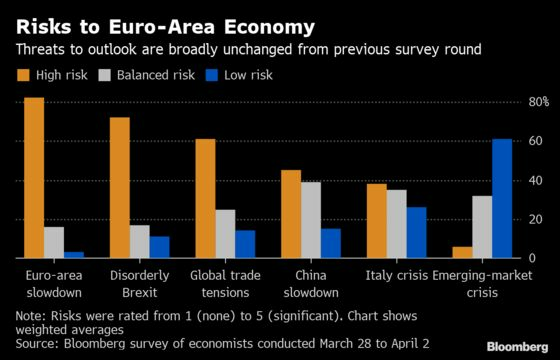 The worsening outlook has also prompted policy makers to float ideas on how they can maintain support after years of weak inflation pushed the ECB to the limits of its toolbox. It’s looking at ways to mitigate the side effects of its negative interest rates, something discussed at the March policy meeting and since publicly highlighted by President Mario Draghi. Dovish shifts are happening at central banks across advanced economies, including the U.S. Federal Reserve which sees no more interest-rate hikes this year. 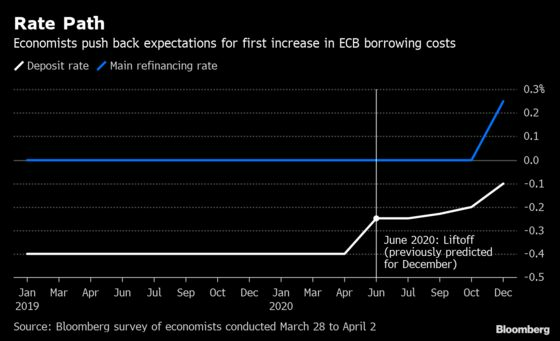 The ECB is expected to hold fire well into next year, with respondents in the Bloomberg survey pushing out their expectations for the first increase to June 2020 from December 2019. Since the Governing Council’s last policy meeting -- when it sharply cut its outlook for 2019 growth -- few of the uncertainties flagged by policy makers have been resolved. The U.K. has yet to strike a deal for the terms of its exit from the European Union, which was originally scheduled for March 29. Survey respondents say a disorderly Brexit is a significant risk to the 19-nation region. Even the ECB’s best efforts to shore up lending and growth with the tools currently being discussed might not help. Economists expect overall take-up of its new long-term loans to total roughly half the amount extended under a previous round launched three years ago. That might encourage policy makers to offer incentives on the loans as well as take action on negative rates, often blamed for holding back credit supply. But such measures may have limited effect.